Canada Place brings FREE world-class community events to residents and visitors alike. Our international award-winning events offer something for everyone. Watch our events video for a quick overview of events at Canada Place. See our event calendar for a full list of events. 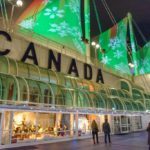 For over 30 years, Christmas at Canada Place has been one of Vancouver’s favourite holiday events, bringing communities together to celebrate the festive season. Highlights include the Woodward’s Windows, the Avenue of Christmas Trees, Canada’s North light display, festive arts and crafts, and much more. Learn more about Christmas at Canada Place. This award-winning event is the largest Canada Day celebration outside our nation’s capital, Ottawa. Canada Day at Canada Place, every July 1, has been Vancouver’s premier event for over 30 years, bringing communities together to share our special bond of living in one of the greatest countries in the world and celebrating our freedom, values and diversity. 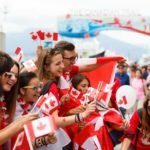 Learn more about Canada Day at Canada Place. Back by popular demand, Waterfront Cinema will be hosted on the North Point at Canada Place. Guests are invited out every Thursday evening from July 11 to August 29 this summer to watch a movie under the stars, featuring great Canadian talent. Learn more about Waterfront Cinema schedule of shows. Waterfront Zumba at Canada Place is a fun, free event hosted on the beautiful North Point of Canada Place. Instructors from Zumba Vancouver will teach classes and provide participants the opportunity to practice Zumba in one of Vancouver’s most stunning locations. No dance experience or partner is needed for this fun fitness class. Learn more about Zumba at Canada Place.